These Pumpkin and Spinach Lasagna Rolls are a quick and easy way to enjoy the comfort of lasagna. Packed with veggies, they are a great fall meal! It’s super foggy and dreary and cold here every morning. Which means we’ve officially used up our 4 days of fall and have made the crossover from summer to winter. Sure, we have four seasons here: beginning of summer, summer, holy crap is it still summer?, and winter. It’s lovely. Really. Since our foggy winter is upon us, it’s time to start breaking out some serious comfort food. And since I’m wishing away “fall” by looking forward to Christmas, it’s time to pack all the pumpkin-y goodness in now. Every fall I usually make this White Chicken Lasagna with Pumpkin and Spinach, which is one of my all time favorite meals, ever. I’m a pasta lover, a cheese lover and a pumpkin lover, and that lasagna is the most delicious, comforting meal ever. But… it’s kind of a bit of work. Which is totally OK some days when I feel like cranking up the Christmas music and spending the day in the kitchen. This particular day I wanted something a little quicker and easier, but I was dreaming of the magical pumpkin and ricotta combo. These lasagna rolls were the perfect solution! Heat olive oil in a large saute pan over medium-high heat. Add onion and garlic and saute until softened, about 5 minutes. Add pumpkin and chicken stock, stir everything together and cook 5 minutes, stirring frequently. Stir in 2 tbsp Parmesan cheese, season with salt & pepper, and removed from heat. In a medium bowl, combine spinach, ricotta, ½ cup Parmesan and egg. Season with salt & pepper and stir until well combined. Spread about ½ cup of the pumpkin sauce in the bottom of an 8-inch square baking dish. Spread a thin layer of ricotta mixture along each lasagna noodle. Starting at one end, roll the ricotta-covered noodles up. Place rolls into the baking dish. Cover rolls with remaining pumpkin sauce, then sprinkle mozzarella cheese over top. Cover with tin foil and bake 40 minutes, until cheese is melted and bubbly. Recipe adapted from Skinny Taste. These lasagna rolls definitely sound like a great way to break into fall (or end fall with in your area)! I love the pumpkin and spinach combo, Jess! It so creative and definitely kicks lasagna to a whole new level! It is getting super cold here too. Fall is officially here! These lasagna roll ups sound delicious! And so pretty! These have to be the prettiest lasagna rolls I’ve ever seen! Love the color and the combination of pumpkin and spinach! Ohhh yes! Sage would definitely be an awesome addition! Great idea! Goodness! 4 days of winter? We have just had 2 weeks of rain and darkness followed by 2 days of sun followed by 2 weeks of rain and darkness! I’m coming to California! 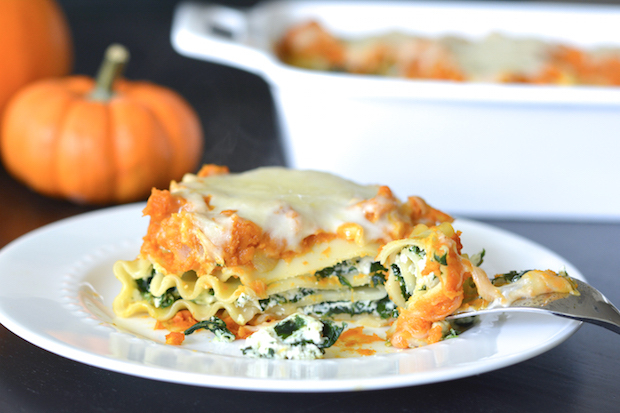 I will spend my 4 days of winter there eating all this pumpkin lasagna! YUM! It’s been cold here too and all we want is comfort food. These lasagna rolls are the perfect way to prepare lasagna! Love the pumpkin and spinach! Omg, i am sooo pleased i found this recipe! I have a container of ricotta in the fridge and a can of pumpkin puree in the pantry waiting to be used. Looks delicious! I absolutely love pumpkin in pasta dishes — it is so good with savory flavors! And these lasagna roll-ups look divine. So perfect for a cool fall dinner. Mmmm. What a great lasagna! I have never had pumpkin in lasagna before, but this definitely sounds like something that I would really enjoy. Perfect for fall/Christmas. Yum. Thanks, Amanda! It was super yummy! Today itself I was thinking, that I need to make lasagna and now I see this!! The flavors sound divine and look so delicious! They are!! Perfect for fall! 🙂 Thanks, Ami! These is a delicious looking fall dinner! These are winter comfort food perfection! Love how creamy they look, especially with pumpkin. Can I have these for dinner?! Ha ha! Here it goes: winter. Still winter. WTF is spring?! Spring. Summer (blink and you miss it) and Winter. No fall, just straight to winter, ha ha! Love the looks of these lasagna roll ups, I have yet to try roll-ups but they look so good! LOL! Ok, I guess I’d rather have extra summer than extra winter!!! I LOVE this! So perfect for fall :). The flavors sound so delicious. Can’t wait to try this one! Pinned! Jess I LOVE this! I make a spicy pumpkin pasta that we totally love so I know this would be a keeper in our house! I love that it is meatless too! Thanks, Annie!! I definitely cook meatless 60-70% of the time now and I kind of love it! I love lasagna, it’s such a comfort meal. I love your pumpkin version, so perfect for autumn! Thanks, Marsha! It was really yummy! I am a huge lasagna lover. This looks amazing. Total comfort food!! Ha! Your comment about fall made me giggle cause I can totally relate. Today was ridiculously cold (at least for my Texas self) so I think winter has come! 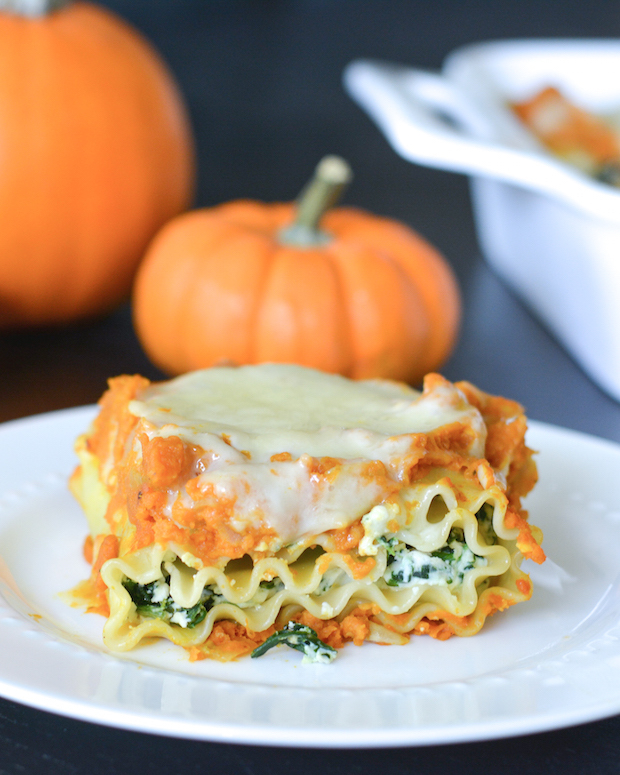 These look incredible, I’m loving the pumpkin-spinach-ricotta combo! I’m loving the colder weather….FINALLY! These roll ups would be perfect for the chilly fall evenings we’re having, and I love that you used pumpkin!